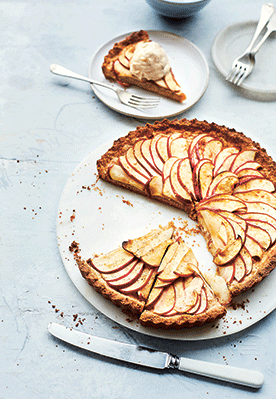 A delicious vegan, sugar- and gluten-free apple tart. 1. Preheat the oven to 170˚C/gas mark 3. 2. In a large bowl, mix the ground almonds, bicarbonate of soda and a pinch of salt. 3. Add 3 tablespoons rice syrup and 3 tablespoons almond butter and mix together with a fork (or pulse in a food-processor) until it looks clumpy but comes together when squeezed. If it’s too dry, add another tablespoon each of rice syrup and almond butter. 5. In a large bowl, mix the apple slices with the cinnamon and coconut sugar, being careful not to break the slices. To make the apple rose, arrange the slices in the tart base from the outside in, overlapping the slices in a spiral, packing them tightly. 6. Place the tart in the oven and bake for 40–45 minutes until golden brown. Leave to cool and serve. Optional extras: Eat the cake with sweet cashew cream or whipped coconut cream. Recipe taken from Vegan in 7 by Rita Serano, published by Kyle Books. Photography by Laura Edwards.